Think the Holiday Season is over? For many of us, it may be. Yet, in the Spanish culture, January is also filled with holidays and traditions – festive gatherings and food included, with the Christmas season being officially over on February 2! The main holiday in January is El Dia De Los Tres Reyes Magos (Three Kings’ Day, or the Epiphany), celebrated on January 6. Spain, as well as most Latin American countries, don’t celebrate December 25 as the day children receive their Christmas gifts. Instead, children get their presents on January 6, El Día de Los Tres Reyes Magos (Three Kings’ Day). This day commemorates the wise men coming to see baby Jesus, bringing the gifts of gold. On this day, children put shoe boxes stuffed with grass for the king’s camels, under their beds. The next morning, the grass is gone, replaced by a gift left by the three kings. And like Christmas, charcoal is left for children who have been naughty. For this holiday, a traditional feast is prepared. 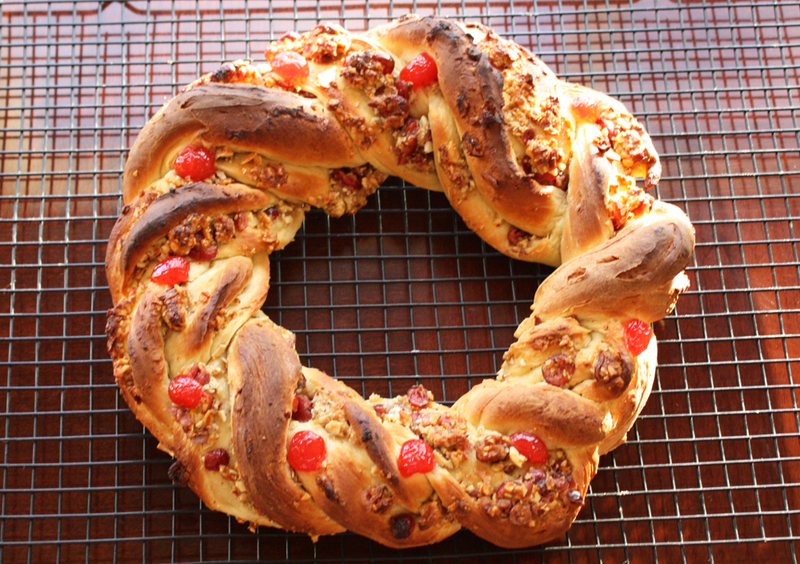 In Mexico, all bakeries offer the Rosca de Reyes, an oval wreath-shaped sweetbread, decorated with candied fruit. This tradition was brought by the Spaniards centuries ago.A plastic figurine of the Baby Jesus is hidden inside the Rosca. Hiding the baby symbolizes the need to find a secure place where Jesus could be born, a place where King Herod would not find Him. During the family gathering, everyone cuts a slice of the Rosca. The knife symbolizes the danger in which the Baby Jesus was in. The guest who gets the baby figurine becomes the hostof the next celebration, Candelaria or Candle mass day on February 2. That day marks the end of the Christmas season in Latin America. This is when the nativity scene is put away. The holiday would not be complete without the traditional family gathering and dinner of tamales and hot chocolate. Although not so widely, Feast of San Antonio Abad to honor animals and Feast of San Sebastian are also celebrated in January. Now, what’s your favorite Spanish or Latin American holiday? Don’t forget to visit Elefloor for Asian real estate offers, including stunning properties for sale and rent in Thailand.